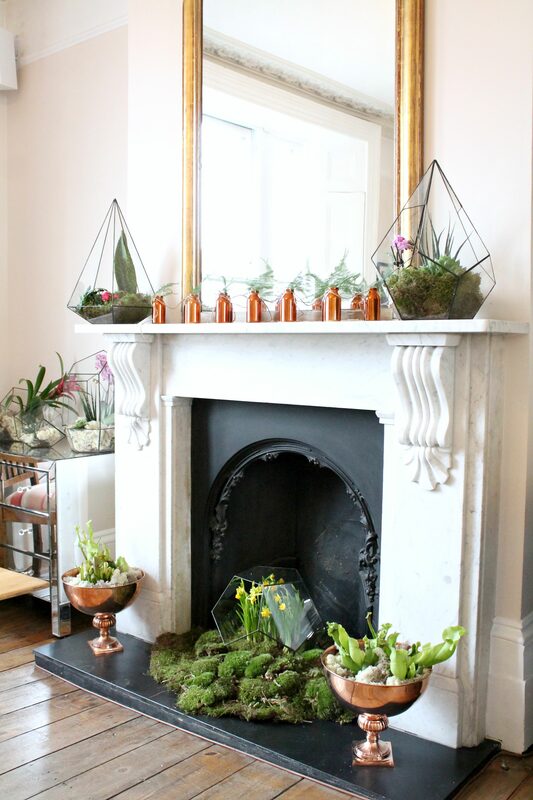 Eco Luxe and Unexpected Wild – 2 trends for decorating with indoor plants. I’ve previously posted the kitchen that I styled for a collaborative project with Red magazine and The Joy of plants. My theme was The Happy Life trend, which was full of celebratory brights. There were 5 other designers who were each asked to style a room in the same Victorian house, in North London. Their themes were very different to mine, hence a separate blog post. The 2 themes in question were the Eco Luxe and Unexpected Wild trends. Styling the Eco Luxe theme in the master bedroom, was Marianne Cotterill, a renowned stylist. Her brief was to create a room as an oasis of tranquility, using elegant natural materials for a sense of comfort and luxury. Materials for the Eco Luxe trend included rough stone, unfinished and polished wood, smooth stainless steel and copper. Toned down greens were used as part of the natural look, copper for a touch of luxury, powerful yellow ochre and black for clarity and order, and white for spaciousness. Those pots created from copper sheet foil were simply stunning and that botanical print dress completed the look of the wall. Beautiful shallow bowls of smooth contours, filled with green shoots were stacked on this elegant dressing table. Examples of Eco Luxe plants are the Monstera and Dracena, that display gradations of colour from dark green to rust and hanging plants such as Nepenthus. Natural textures and materials were inter mingled and layered, creating a sense of depth. Green was accentuated by metal black, white and wood, all working harmoniously. Terrariums and upcycled milk bottles were used to display plants. That Cire Trudon candle really set the mood for the room. Such a great idea to use recycled corks to display succulents. Next, is the work of Lucy Serafi, owner of The Urban Botanist, with her own interpretation of Eco Luxe. Love those Copper bottles flanked by beautifully styled Terrariums. As we move out into the the hall and stairways, we were met by the Unexpected Wild theme. These have been created by Ian Drummond, the creative director of Indoor Garden Design. What can I say? I need to reproduce this hanging orchid look at home. And this! absolutely gorgeous! Take a look at the bathroom he styled below. What luxury, to have a fireplace in the bathroom surrounded by wild and lush greens. How about this for an after work soak? It’s like taking a dip in the wilderness. More bathroom creativity. 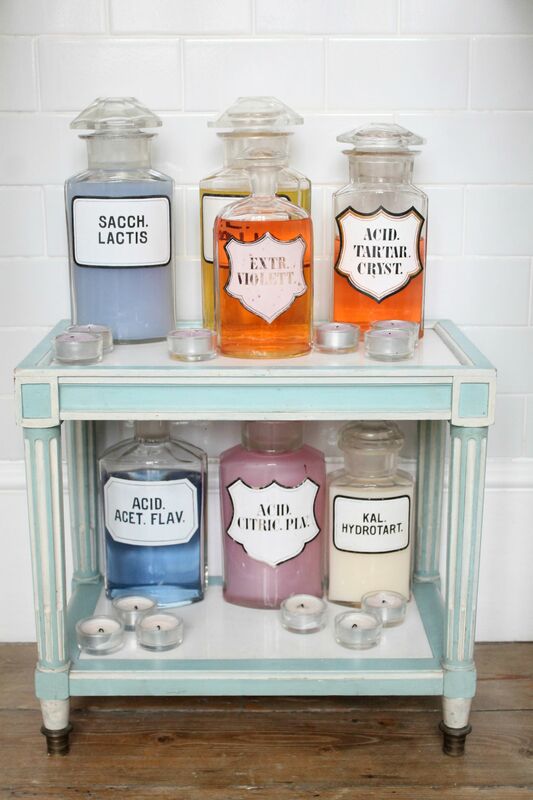 Naturally, I had to snap this as it was colourful, and such an amazing idea for bubble bath storage. The Unexpected Wild theme continued into the dining room. This was styled by Red Magazine’s Interiors Editor, Sarah Keady. Love the idea of foliage in glass jars of varying sizes, that adorned both the fireplace and dining table. A natural tone of wood and creams. The look had been softened by the use of Asparagus ferns in the place settings. Old step ladders and crates with vintage books were used to display potted greens. A closer view. Here, Joanna Thornhill, also a stylist, has put her interpretation too on the Unexpected Wild theme, but with pops of colour. Love this idea of sprouting bulbs from glass jars. Hope you’ve enjoyed the green inspiration. I have thoroughly enjoyed working on this project with my fellow designer friends. How to style a colourful kitchen in the Happy Life trend with botanicals. This weekend has been both colourful and busy. A few weeks ago, I was asked by both the The Joy of plants, part of the Flower Council of Holland and Red Magazine to style a kitchen in an event to showcase the Happy Life Trend. The event was designed to show consumers how inspirational and versatile houseplants can look in the home. The Happy Life trend is all about taking a lighter approach to life and let go of the old world with all its rules and expectations. I spent the weekend before the event painting egg cups in the Happy Life palette, to use for the kitchen table that I was due to style. Here is the table. The Happy Life is a room that is cheery and colourful, where everyone is welcome, and where the sun always seem to shine. Shapes are unexpected, childlike in their simplicity, reminiscent of a box of building blocks. Soft pastels are combined with bright accent colours, preventing sharp geometric shapes from appearing cool and impassive. The room is decorated such that a party could spontaneously break out at any moment. Smooth ceramics and glass are intertwined with playful patterns. Polka dots and confetti like cake or candy. Sugary pastels are mixed with burnt caramel browns, like cookies and chocolate. Those mint green linen placemats are from Designer’s Guild. Mismatched wooden chairs were upcycled with a coat of chalk paint. These were created by my friend Louisa Blackmore of West Egg interiors. Absolutely adore this candy pink chair against that caramel brown rose – the Happy Life palette. What do you think? Does this table with its wave of colour, patterns and shapes reflect the joy and optimism of the brief? As well as painting egg cups in the required palette, I decided to decorate some wooden utensils and pots for the bright botanicals that are due to be displayed. These were easy to create, just use washi or masking tape to section off and paint with acrylics, peel off tape, then seal with decopatch glue. Here is the Happy Life kitchen cabinet that I styled. Forget rules and expectations, why should cabinet doors be closed when hiding behind them are colourful rays of sunshine? Why limit kitchen cabinets and surfaces to plates and mugs, decorate with books and accessories. If you have a cabinet that gets the sun, place your potted brights in there too. Here I have decorated with Narcissus, Gerberas, Sunflowers and Kalanchoe. Other beautiful Happy Life flowers you can use are Hibiscus and Guzmanias. The painted egg cups were filled with Asparagus plant shoots and peppered throughout the table that I styled. That orange striped Prism cushion is by Kangan Arora and can be bought from Future and Found. As part of my mood board, I decided to have Ikea step stools upcycled in the trend’s colour palette. The stools were created for me by my talented friend Klara of So Klara. The perfect stepping stools for the kitchen with their individual decorative styles, with the added bonus of being able to be used as plant display stands. Klara spray painted the stools in white, three coats I was told. She then painted them in acrylics. I am so loving the hints of chocolate mixed with pastels and brights. As well as styling the kitchen, I ran DIY workshops for 2 days at the event. I decided to upcycle pots with decorative effects. Here were some that I have created. You can start by spray painting old terracotta pots in bright hues. I then painted the pots in contrasting bands of colour, using acrylics followed by sealant. I also demonstrated the technique of gold foiling at the workshop. Making simple geometric shapes on pots that instantly lifted the look. The gold foil shapes look great contrasted with the colour banded pots. The Gold leaf technique is simple. Use washi tape to make your triangle, apply gilding paste, making sure you overlap paste over part of the tape edges and base of the pot. Leave to set for 15 mins, then apply the gold leaf sheet. Smooth over creases using a soft but broad brush and then tear out the tape. To protect, you can apply a thin layer of the gilding paste on top. The purple houseplant above is Campanula, also part of the Happy Life trend. Here are more images of what others have created. There was also a spray painting workshop on bottles at the event. As well as using sheets of gold foil leaf to decorate, gold foil paint can also be used to create your own desired patterns. Hope you’ve enjoyed viewing how I have pulled together the Happy Life trend for the kitchen, playing with colours, shapes and happy botanicals.